Easing heavy flow of traffic in one of the most congested city of Panjim has come as a top priority for local authorities. The State capital witnesses 90,000-odd vehicles entering and exiting on a daily basis and while crawling traffic during peak hours tests one's patience. Of course, it is an understatement to note that the festive season adds to the burden on the roads. In the budget of 2017-18, Chief Minister Manohar Parrikar proposed to draft and implement a dedicated traffic management plan for Panjim, besides Margao, Vasco, Mapusa and Ponda to solve the ever-growing traffic congestion. The government also has a major task of curbing violations by strictly enforcing the existing traffic rules, and to tackle the plaguing problems of acute parking shortage and poor road conditions. While the plan is being chalked out by traffic department and other concerned authorities, Imagine Panjim Smart City Development Ltd (IPSCDL) has espoused an immediate solution, which currently is on a trial run. On lines with rental cabs and bikes, bicycles are now available on rent under the Smart City Mission. The Smart team introduced 20 bicycles in the city. 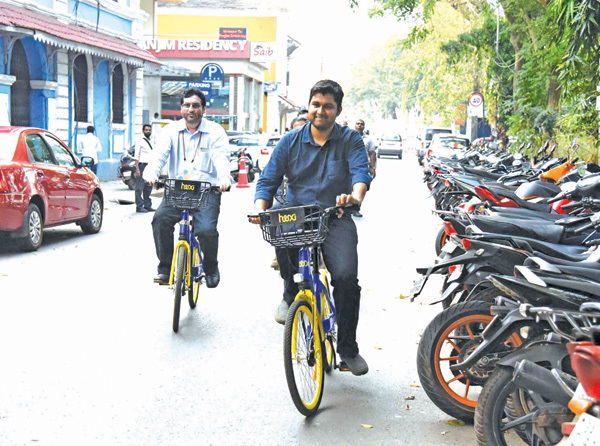 Hero Cycles launched the first pilot Public Cycle Sharing System in Smart City Panjim earlier this month under which two cycle stands have been set up - at old secretariat and old PWD office at Patto. The project has gained huge response particularly at Serendipity Arts festival that saw volunteers going around the city on cycles. Managing Director and CEO at Imagine Panjim Swayan Chaudhuri said this is an attempt to also help reduce noise and air pollution caused due to vehicles. "It will reduce pollution and ease traffic congestion. We also believe it will also boost tourism..." he said. Explaining about the pilot project, Chaudhuri said the agency launched 20 bicycles on pilot project with 80 more to be added shortly. "At present, 20 cycles are on the roads. These were used during the Serendipity Art festival. Our proposal is to have at least 100 cycles to start with, and depending on the feedback/response we will expand the fleet," he said. In the next three months, the project's implementation will be full-fledged with IPSCDL tentatively identifying 60 docking stations across the city. "We are conducting a detailed study... Apart from 100 cycles on the cards, 60 docking stations are identified but it is being reassessed," the CEO said. Explaining the concept in a conversation with HERALD, Chaudhuri revealed that a cyclist will have the liberty to park the cycle at any identified docking stations but to avail the scheme, possessing Smart Card will be a must. "The cycles will be GPS enabled and have remote locking system. A cycle share user must have a Smart Card to swipe at any picking point and park at any docking station... tracking the cycles will be an easy task as every safety measure will be taken. We are working on this idea at the moment," he said. The IPSCDL is taking a step further by working on the last mile connectivity and contemplating creating more parking spaces. With the cycle sharing scene expected to heat up in the coming days, the trial period saw an impressive feedback from the cyclists who comprised of 80 percent under the age of 30 years and 20 percent below 20 years of age. Chaudhuri claimed that senior citizens too enjoyed the cycle ride. Preliminary analyses found that 58 per cent males and 42 per cent females rode the cycles. Out of 220 respondents (the cycle share users were much more), some suggested electric/geared cycles which the IPSCDL maintained it was trying to explore this possibility. Such cycles will be useful for slopes like Altinho. We will place this proposal before the government, the CEO added. While cycling track will indeed be an added asset to the city, the agency - working on a fast track - has already tendered 3 kms stretch to a firm. Details shared with Herald shows that work of the stretch from Senior Citizens Park at Campal to Children's Park, Opposite Directorate of Health Services has begun. Phase-2, Chaudhuri said will cover the belt from the Children's Park till the promenade opposite Old GMC as well as Senior Citizens Park to Miramar. This level might also include construction of a soft infrastructure for the kiosks, conducting business along the beach area. The mega project will also develop the Miramar - Dona Paula for cycling track. It would be a good view for the cyclists on the dedicated cycling track. The environment-friendly project will soon begin and at the same pace complete, he said hoping the cycling share system will rapidly reduce use of vehicles on the roads. What's interesting is that though the Smart City project is restricted to Panjim, the cycle share system could also be replicated in other cities of Goa. Chaudhuri said the government is positively considering this proposal.